Eve and Matt over at SF Appeal reminded us of this Saturday’s somber-yet-timely death of the 74X-Culture Bus. So SF Appeal is proposing a ride on the Culture Bus on its last day of service to our fair tourists. Go show this waste of a Muni route your love, and show the world that San Francisco still has a lot of culture, just no need for an overpriced, redundant bus route with no riders. 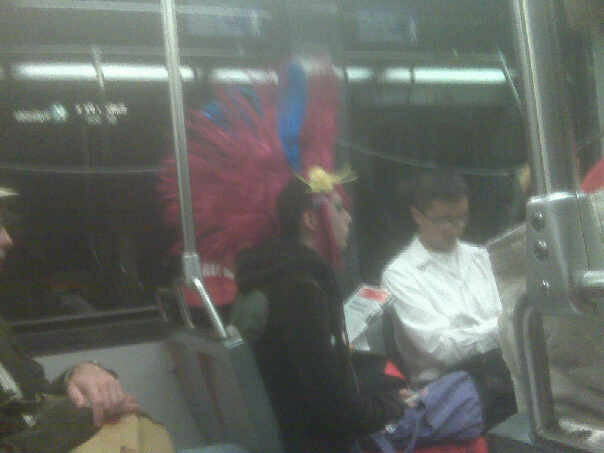 It was pretty interesting when I was taking the 49 home from the Mission the other day. There was this kid playing the Tenor. Then, this guy gets on the bus at 24th with a guitar, and soon notices the teenager playing the tenor. He looks, and the guy who is playing the tenor smiles. They chat, although there’s a language barrier between them, one who speaks little English (the one with the guitar) and the one who speaks no Spanish (the one who has the tenor). They talk a little, and they play a mini duet by the time we get to 16th. Some lady eating a Fruit & Yogurt Parfait watches them play, as well as some other people on the bus. The guy with the guitar gets off at Sutter with his other pal sitting opposite to him, opposite of the back door where the kid was playing. He gets off later. Don’t know where. Don’t care. But it’s interesting to see a teenager teaching someone to play and getting some fun out of it. 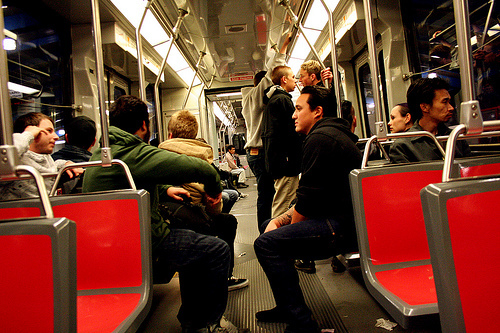 Send us your observations of poignancy on Muni, and anything else you feel like sharing. Last night I took the K to West Portal. I don’t know when she got on the train because I was busy playing with the new apps on my blackberry, but sometime between Forest Hill and West Portal I looked up and saw her. She looked like a beautiful, swirly and colorful cartoon. She had stars and swirly things painted on her face. She had fake flowers tucked into her mohawk. I’m so glad I put down my crackberry and enjoyed the ride. Saw something intriging on the bus? Email us at muni.diaries.sf@gmail.com. Good Morning, My American Friends! Help us stay on time. It is up to you. Anticipate your exit. Be patient. We all work together. America is beautiful, and trust me, I’ve lived in a lot of places. Everyone here helps each other. It is a beautiful morning! I request this time for working because you are all so special to me. Someone out there loves you. Muni loves you. You are just beginning your day, but I am ending mine now. Have a beautiful day. One time he told us the set-up of a joke at the start of the tunnel and told us the answer at Embarcadero. I want to write to Muni and tell them how great he is, but I keep forgetting to write down the coach number. Photo by Flickr user The Retrospective. Share your own Muni driver story! One can only hope we have more drivers like this. 1. The Wave-Hello Guy. If you walk to BART on 16th Street around 8:30 a.m., you’re likely to pass him. He’s always smiling wide and waving hello to everyone who crosses his path. I assume he is going to Creativity Explored, but really I have no idea. He’s a white guy, probably in his late thirties, balding with a black backpack. He gets really happy if you say hello and wave back. It’s a great feeling. Today when I waved back, he gestured for a high five, and I gave him one. Maybe it was silly, but I couldn’t help smiling as I walked on. 2. The silence. I love being surrounded by people who are all in the same quiet state. There’s a sense of togetherness and peace. (Yoga might be getting to me). But really, as long as it’s not crazy-crowded like getting on a train at Church and Market, it’s nice to sit among strangers and just be quiet for little bit before the bustling of the day starts. It’s a moment of pause. Some people read, others think and daydream, and some even dose off — which to me is also a sign of feeling safe in your surroundings. How often does riding the 47 line make you feel warm and fuzzy? Not very much, I bet. Yes, it’s the line that , if it arrives at all, goes down Van Ness into the deeeeeep SOMA for some stinky local flavor that make you want to Purell your whole body over. Anybody else spot this delightfully altered sign in the 47 bus?